A couple of things I am loving the hell out of. I don’t know if you haven’t hear yet, but Sara Bareilles released her sophomore album Tuesday. And it’s absolutely incredible. Proof that there is still amazing women artists out there to compete with the autotuned Ke$ha and Katy Perry. My new favorite song is this one, it’s called Uncharted and I “might be” driving around with it on repeat singing to it at the top of my lungs. 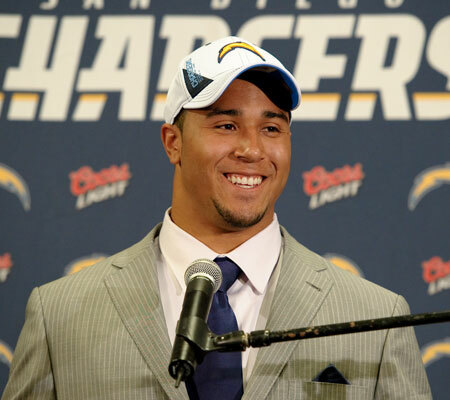 Blog, meet Ryan Mathews. He’s kind of a big deal. He’s what’s going to make or break the Chargers season. No pressure. And finally. I am PUMPED for New Years. Wanna know why? Because Nora and Ashley are looking into coming to San Francisco for it. That’s crazy. I’m so excited I can’t breath. If you want to come too? Let me know. What are you excited about?! You'll kick nothing of the sort, woman. I bought the Sara Bareilles cd this week as well and am also loving her. Her voice is amazing. I'll see her live in November and can't wait!!! 1) New Years is my birthday, yay! 2) I downloaded SB's album last night and am in TRULY MADLY DEEPLY love with it. 3) Um, yes. Nora in San Fran, pretty please! I'm going through SF withdrawals, it's been a whole MONTH since I've been in the city. Ridiculous. Must remedy. What is this NYE plan? I want to be in. Um I would so love to come to SF for New Years!! Can the Ashleys all come? This makes me so incredibly happy. I love Sara Bareilles, football, and our NYE plans. LOOOOOVE. I REALLY wanna read the Hunger Games trilogy, but I'm broke. Maybe they have them at the library. AMEN on the Hunger Games series. I'm halfway through Mockingjay! I would also highly recommend the Fablehaven series! Everyone has been talking about the Hunger Games trilogy lately! I can't wait to read them. New Year's in SF?! YAY! Big party plans? I'm excited for October… It's usually even nicer than September, and it's my birthday month. I have a Hawaii trip planned! WOO! Previous Previous post: What I learned, Soul Weekend 2010. Next Next post: So, last night I decided to move.